Shannon's Fire Brewed Irish Red — Two Old Guys Drinking Beer! Shannon Irish Red has a beautiful deep copper hue associated with fine Crystal Malts. This ale also has a wonderful malty start, a gentle hop aroma and crisp clean finish. Our red ale has a perfect balance between malt flavor and hop aroma with subtle hints of baked fruit. 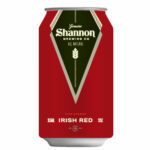 Shannon Irish Red is our nod to Saint Patrick, the most recognized patron saint of Ireland. Just in case you are curious, we will NEVER brew a green beer. This is one of my favorite's so far in the course of the podcast. Refreshing, great aroma, and quite tasty. I gave it a 4 while Bill gave it a 3. I think you'll like it, give it a try!